Truck Bed Campers are a great option if you want small RVs for fulltime rving. If you own a truck you're half way to owning a very practical fulltime RV. One of the most popular truck bed campers is the Lance which comes in several models including ones with slide-outs. If you already own a truck the purchase price of a truck camper can be far less than a motorhome. Truck camper shells range in price depending on the size, equipment and quality of construction, but because there's no chassis or motor the cost is far less than a motorhome. Many truck camper tops have the same equipment you would find in a moderately priced motorhome. The only major difference is living space. Truck bed campers are efficient, well-designed, highly maneuverable and extremely comfortable for one or two persons. In most states insurance on small truck campers will be far less than a motorhome and somewhat less than a travel trailer. In most cases an insurance rider is all that is needed to cover the truck camper in addition to your regular truck insurance. Because the camper is considered cargo rather than a vehicle, most states don't require an annual license for a slide-in camper. This can be a significant savings over a traditional motorhome insurance and licensing. 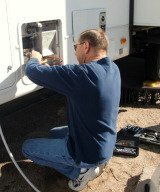 Only a few states will permit towing behind another trailer. So if you have a boat, personal watercraft, horse trailer, snowmobiles  or anything else you wish to tow  a truck and camper is the best option to tow with. With four-wheel drive capabilities of a truck and you can go and tow places you would never dream of reaching with a motorhome. 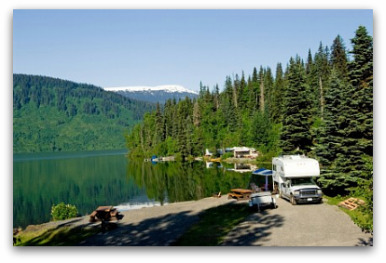 With truck bed campers you can set up camp in just a couple of minutes, and be free to take your truck and head out for some sightseeing or launch your boat. Small truck campers get far better gas mileage than a larger, heavier motorhome, and newer trucks get much better fuel economy when used for transportation without the camper. If your truck needs service you don't sacrifice your living area like you do when you take a motorhome in for service. You can simply park your truck camper in an RV spot while the truck is in for service. Driving a truck with a camper isn't much different than driving a truck. Many people are comfortable driving a truck and camper rather than a big, wide motorhome. Buying a used truck camper may save you some money, although used Lance's hold their value very well. Explorer and urban wilderness survival expert Brian Brawdy is a great example of living in a truck camper fulltime. He lives full-time out of his Lance 1181 with the goal of visiting 49 states within 2008 as part of his "Wonder Explore Believe" tour.